It is becoming more commonly known that probiotics (found in yogurt) are really important to our overall health because they improve digestion. And our digestive health has a big effect on our overall immune health. 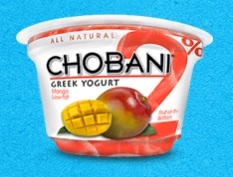 Chobani yogurt is Greek style yogurt (like Fage). If you've tried Greek yogurt you have probably noticed it has a much creamier texture than regular yogurt. Much more satisfying in my view. I was a little curious about why Greek yogurt is so thick and creamy (and yet so low fat) so I took a peek at Chobani's website. They explain that the thick, creamy texture is the result of a "centuries-old straining technique" to reduce liquid. No yucky thickening agents added, which is a plus in my book. As for flavors, they come in low fat, non fat, and a low calorie diet sized cup called Chobani champions. The low fat flavors (4 weight watchers points plus points) include mango, plain, pineapple, and strawberry banana, and the non fat flavors (also 4 weight watchers points plus points) include black cherry, lemon, plain, blueberry, honey, raspberry, peach, pomegranate, strawberry, and vanilla. There are also two Chobani Champion flavors (at 100 calories each, and only 2 weight watchers points plus points) in very berry flavor and honey nana, both of which I've tried and can say are super delicious. Some of the fruity flavors (like pineapple and mango) have real chunks of fruit in them vs. the sugary syrups that accompany many of the other greek yogurts. I love this! And, most of the flavors are very high in protein, around double of most traditional yogurts, so if you are searching for a way to get more protein into your diet without eating meats, Chobani may be a good choice for you. If you want a little extra crunch in your yogurt, you can sprinkle some low calorie granola or cereal in your yogurt cup, making it a perfect low calorie breakfast or snack. Thanks for the shout-out, Juliet! CHOBANI Yogurt it's looked like yummy, I love the mango flavor. But I don't know where to get this yogurt because I can't find it at market here. I absolutely LOVE the Chobani yogurts. So good!